The twee town of Torquay, on England’s Devon coast, has two major claims to fame: It was the birthplace and longtime home of mystery writer Agatha Christie, and it’s the home of Kents Cavern, one of the United Kingdom’s most important archaeological sites. Last year, researchers reported that an upper jaw found in the cave could be the oldest modern human fossil in Europe. But a new study questions that claim, arguing that the date of the jawbone may never be known with certainty. The controversy has an important bearing on debates about the spread of Homo sapiens out of Africa. "One bad date can rewrite the entire prehistory of our species in Europe," says Paul Pettitt, an archaeologist at the University of Sheffield in the United Kingdom and co-author of the new study, which is in press at the European Journal of Archaeology. But members of the original team, who published their dating results last year inNature, have responded sharply to the criticisms. The new study's conclusions, says Thomas Higham, a radiocarbon dating expert at the University of Oxford in the United Kingdom and lead author of theNature paper, "expose a breathtaking ignorance of the [new] developments in scientific approaches to the past." This date for the jawbone was consistent with then-current views that modern humans had entered Europe about 40,000 years ago and then spread from east to west. But it was suspect because the fossil bore traces of animal-based glue that earlier researchers had used to rejoin the bone and teeth, which were found separately. Modern carbon in the glue could make the bone appear younger than it really is. In last year's Nature study, Higham and his colleagues tried to get around this problem by dating animal bones found above and below the fossil, and then subjecting those dates to mathematical treatment to get the best fit. The result was surprising: The jawbone clocked in at between 41,500 and 44,000 years. And a study of the teeth by the team’s anthropologists concluded that it was most probably a modern human rather than a Neandertal. In the new paper, which will be published later this month, Pettitt and archaeologist Mark White of Durham University in the United Kingdom blast away at these dating results on the grounds that it’s unclear exactly where the jawbone was found. Pettitt and White, who have been conducting renewed excavations in Kents Cavern since 2009, delved into the old excavation records for the site, including those for Ogilvie's years of digging. The pair argues that both Ogilvie's excavations and his record-keeping were sloppy, even by the standards of the day. As a result, White and Pettitt contend, it’s impossible to determine the exact location of the fossil or of the animal bones above and below it. To make things worse, they argue, there is evidence that sediments in the cave may have moved around over the millennia since the fossil was deposited there. "Sadly," the pair writes in the last sentence of their paper, the jawbone "may just [as] well have stayed in the ground for all its value to modern Paleoanthropology." Both sides of the debate agree that there is a lot riding on the outcome. "What is at stake is the entire [prehistory] of Neandertals and early modern humans in Europe," Pettitt says. Apart from the Kents Cavern fossil and some 43,000- to 45,000-year-old teeth from Italy whose status as modern human or Neandertal is currently also debated, the oldest undisputed human fossils in Europe are about only 40,000 years old and come from a site in Romania. If modern humans really made it all the way to northwest Europe by 41,500 years ago or even earlier, it would mean that they entered Europe much earlier than once thought and also spread across the continent very rapidly. It would also increase the overlap between modern humans and the Neandertals, who already lived in Europe, and who went extinct sometime between 40,000 and 35,000 years ago. What’s more, such an overlap could make it more likely that Neandertals, who made sophisticated ornaments and tools in their last years, copied these techniques from modern humans rather than inventing them on their own. But Higham and his colleagues reject the White-Pettitt critique. They take particular umbrage at the suggestion that they misunderstood the cave's stratigraphy. 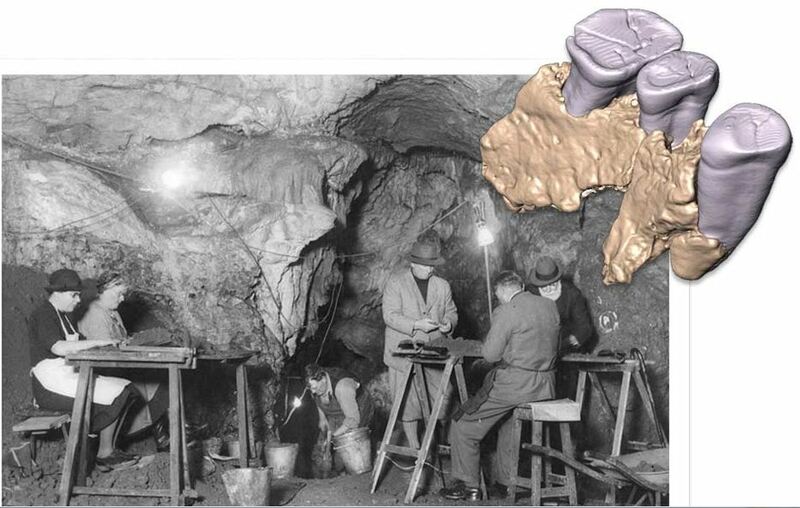 The mathematical model they used to fine-tune the dates was based on a study of the cave by deceased archaeologist Roger Jacobi of the British Museum who "knew the site … better than anyone," Higham says. He adds that "we are not naïve enough to think that nothing has moved" in the cave, but that even when he and his colleagues assumed such movement in its model they still came out with dates of at least 41,000 years. Another member of Higham's team, Chris Stringer, a paleoanthropologist at the Natural History Museum in London, disputes White’s and Pettitt's suggestion that the jawbone might belong to a Neandertal rather than a modern human. "We can say with confidence that no Neandertal fossil known to us shows anything like the number of modern features that we observed," he says. Higham hopes his team can try to directly radiocarbon date the jawbone again one day, although he is reluctant to do it now because there is very little bone left. In the meantime, the exact age of the fossil and who it belonged to might remain a mystery worthy of Christie, who made Kents Cavern a central part of the plot in one of her many books.